What Is Configserver Security And Firewall (CSF) ? CSF is commonly used firewall that provides a good level of protection with easy to manage commands. It is used for Login/Intrusion detection, SSH login notification, Excessive connection blocking, Suspicious file reporting etc. 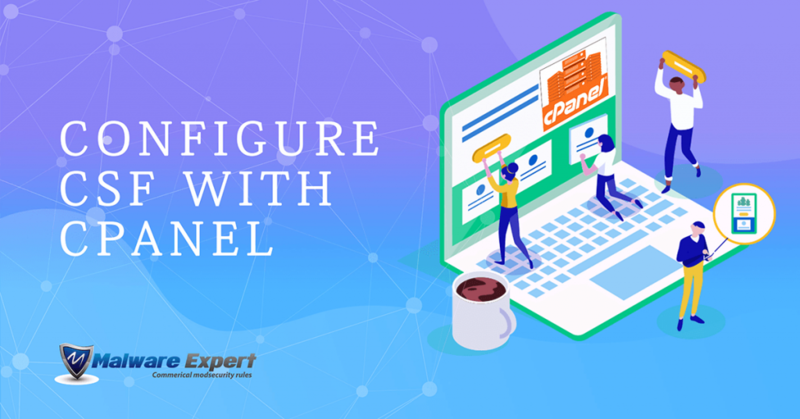 In this tutorial, we will go through the Configuration of CSF in cPanel server and also the basic and most important configuration options in CSF configuration as below. Once CSF is installed on server and started its service by default CSF is installed in ‘Testing’ mode, to change this you need to make the following change in the CSF configuration file via backend or by CSF plugin avaliable in WHM. TESTING = "1" to TESTING = "0"
Since attackers often exploit open ports in the server, only necessary ports should only be opended and other should be closed in the CSF firewall. It can also be made possible by using TCP and UDP ports in the CSF configuration file. The CSF will block all other ports which are not listed on allowing ports on configuration file. You need to add port list in below section in the configuration file where you can allow the incoming and outgoing TCP and UDP ports. Always restart CSF service once you have made changes on configuration file. If you have changed your SSH port number, you need to add this new port on the TCP_IN Section. -Local-infile=0 in mysql configuration file. -WHM > Tweak Settings > Always redirect users to the ssl/tls ports when visiting /cpanel, /webmail. -Disable WHM - Tweak Settings - Proxy subdomains. So after making this changes you will get a score according to the security you have done in csf like below. Your Score: 115/141* , the values may get vary in coming updates of CSF. ConfigServe Firewall (CSF) is a firewall configuration script created to provide better security for your server while giving you an easy to use and advanced interface for managing your firewall settings in cPanel servers. CSF configures your server’s firewall to lock down public access to services and only allow certain connections, such as logging in to FTP, checking your email, or loading your websites, but it’s not enough protect your web hosting server. That’s why you need ModSecurity (ModSec) which helps protect your websites from external attacks. As a web application firewall (WAF), ModSecurity detects and blocks unwanted intrusions into your site. As an industry-standard open source WAF, ModSecurity serves as a strong and flexible resource for not only system administrators, but for all end-users, including merchants. We recommended that you deploy ModSecurity on every server and consider it one of the core components of your site’s security. If you don’t wanna build own rules, you can use Malware.Expert – ModSecurity rules to protect your web server vulnerabilities and attacks.